The Northport High School environmental team, also known as the “E-Team”, hosted a school-wide eco-challenge during the week of April 16. Participating students encouraged their classmates to pledge to complete an environmentally-friendly challenge for a week in honor of Earth Day. Approximately 200 students accepted the challenge, pledging to practice actions like including take shorter showers, turning the sink off while brushing their teeth, drinking from reusable water bottles, using reusable bags and participating in “meatless Mondays.” In addition, students collected water bottles to recycle, and at the week’s end, had approximately 1,400 bottles. The E-Team was instrumental in the recent implementation of the Suffolk County bag bill, and they are continuing to take steps to conserving resources and the Earth. 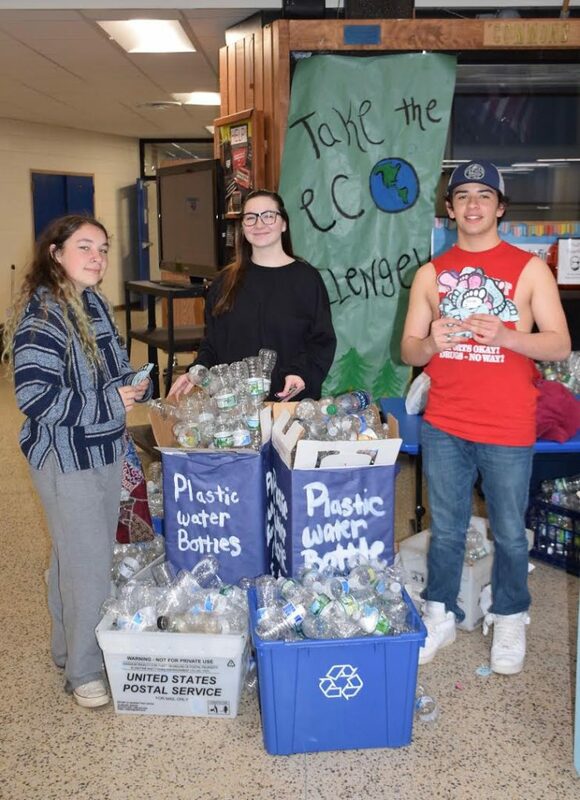 Photo caption: Northport High School E-Team members Francesca, Shannon, and Louie participated in the eco-challenge during the week of April 16.